Nestled in the middle of White Sands Missile Range in New Mexico (the site of the first atomic bomb test) is White Sands National Monument; 143,000 acres of unique gypsum dunes. This is the world’s largest gypsum dune field, formed some 250 million years ago when the area was a shallow sea. 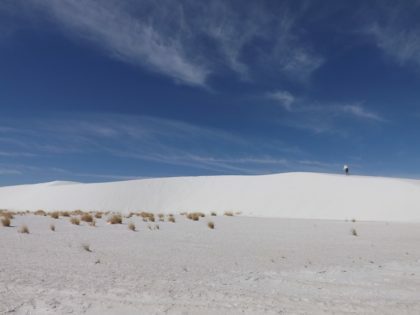 Established in 1933 by President Herbert Hoover, White Sands National Monument is the most visited national park unit in the state of New Mexico. Last year it attracted over 600,000 visitors to its sparkling white dunes. It is hard to believe that this was once covered in water. There is one lake – Lake Lucero – but for the majority of the year it is dry, only wet after rare heavy rains. What is now the Alkali Flat area is actually the exposed bed of an ice age lake. Now the area is covered in sand dunes, blown by the wind to form hills and valleys covered by rippling sand. Walk in these dunes and hours later your footsteps are erased. You’d never know that anyone has ever been there. All visitors should take the 8 mile drive into the heart of the dunes. We drove this on our motorcycle and it was amazing. So peaceful and silent. In fact, the only place that we have been that is quieter may be Death Valley. You should probably check for road conditions at the visitor center. Strong winds can cause the dunes to cover the road. Keep an eye out for dust storms. We watched one from our campground, higher up on the mountain. You could see the wind as it came through and picked up the sand. Sand filled the sky and wiped out the sun, slowly spreading a white cloud over the valley. Spectacular to watch – from a distance. There are four marked trails, one that is wheelchair accessible on a boardwalk. 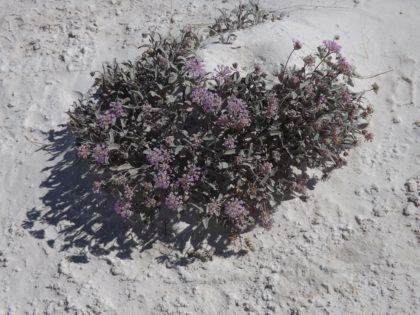 What we found surprising was that there were some trees and flowers growing in the sand. These hardy plants have found a way to survive. If you are lucky you may see some of the animals that live in the park, or at least their footprints. Most are nocturnal although there are some birds and reptiles that are active during the day. If you take a ranger-led walk they will tell you all about the plants and animals. It really is startling how much life there is at White Sands. You can find out about the ranger-led programs at the visitor center. The historic adobe building is one of the originals, named to the National Register of Historic Places in 1988. 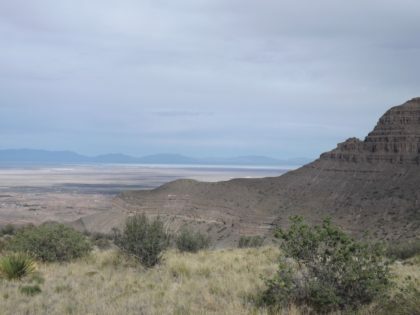 Poke around there to learn more about the history of the area and the geology. It is really interesting to see how the area was formed and how the dunes change over time. The rangers will also give you some tips on how to get the best photographs. You can get some amazing photographs of the dunes, especially early in the morning or late in the day. Stay a bit later and do some star gazing. It is incredible how dark the skies are in southern New Mexico. Be careful if you visit in the summer. Take plenty of water, wear sunscreen and avoid the heat of the day when temperatures easily exceed 100 degrees Fahrenheit. 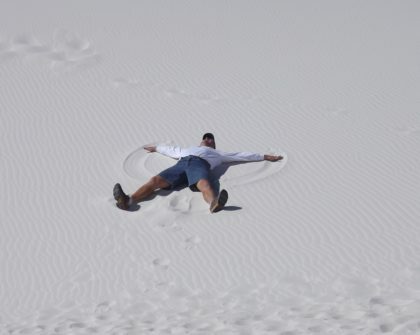 Where to stay when visiting White Sands National Monument? 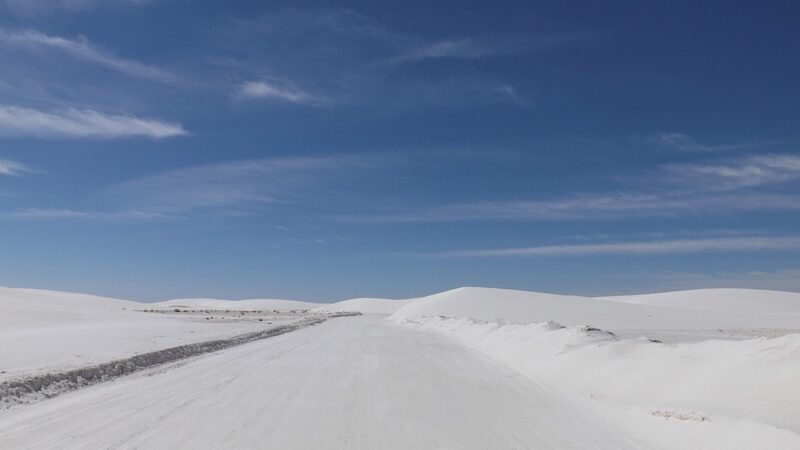 The closest city to White Sands National Monument is Alamogordo, just 16 miles away. You may also take a day trip from Las Cruces (only about 65 miles away) or El Paso (around 100 miles). All of these cities offer lots of accommodations and many other interesting places to visit. If you camp, be aware that there is no camping in the park (other than backcountry camping by permit only). But there is a very nice state park close by – Oliver Lee Memorial State Park. It is a bit higher in elevation and has some great hiking up into the canyon. We really enjoyed our stay there. 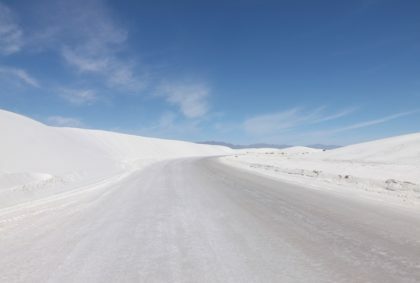 When to go to White Sands National Monument? We loved the spring – there were flowers everywhere, even on the dunes. But no matter when you go, you should check to make sure the park is open. Since it is in the middle of the missile range, periodically the park is closed for safety during missile tests. It is usually only for an hour or two but you will want to know this before you arrive. 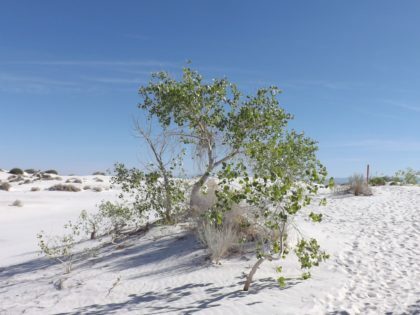 Will White Sands be National Park number 61? 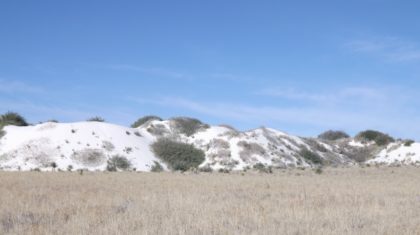 In May 2018, Senator Heinrich from New Mexico announced plans to request that White Sands National Monument be redesigned as a National Park. Along with changes in how the park would be funded, elevating the park to National Park status also promises to increase visitation – usually by 20% according to the National Park Service. 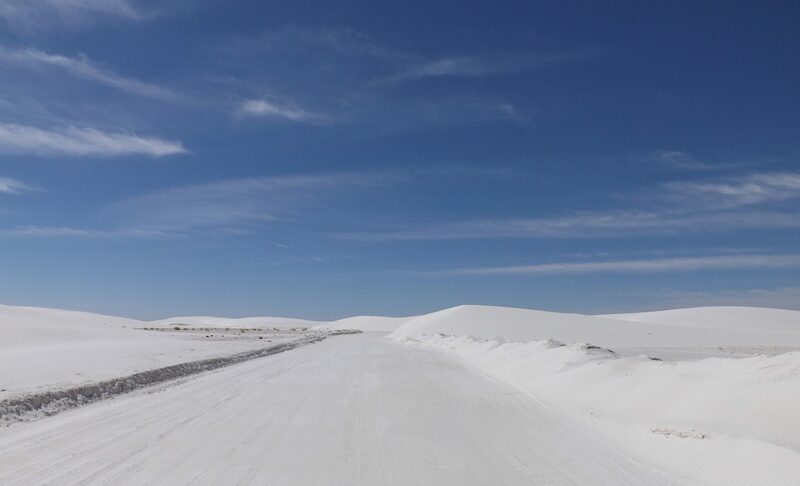 National Park or National Monument – either way, White Sands is worth a visit.